With the Chicago skyline hazed over, light air tactics were on full display for the twelve teams competing in day one of the 2018 M32 World Championship. Two races were completed before a third race was abandoned as the wind shut-off with teams making their way to shore early to prepare for what promises to be heavy wind conditions tomorrow. Early in race one, ChinaOne.Ningbo found the pressure and had to commit so as not to lose their lead during maneuvers. Skipper Phil Robertson capitalized on a wind differential on the left side of the course, rocketing to the finish ten boat lengths ahead of Torrent Racing. However, while ChinaOne.Ningbo defended their lead, a war was unfolding in the Wilson family between Don Wilson’s Convexity, and Jennifer Wilson’s Convergence. “Today was all about clean air. When you could find it, you just had to keep connecting the dots to stay in good pressure,” said Jennifer. At the end of day one, Convergence sits poised immediately behind ChinaOne.Ningbo in the standings with a two-point lead over of Convexity. However, it’s not only the battle between the local brother-sister duo that heated up today, as Ava, Don’s 16-year-old daughter, is also aboard Convergence with her aim set on upsetting her dad’s team. 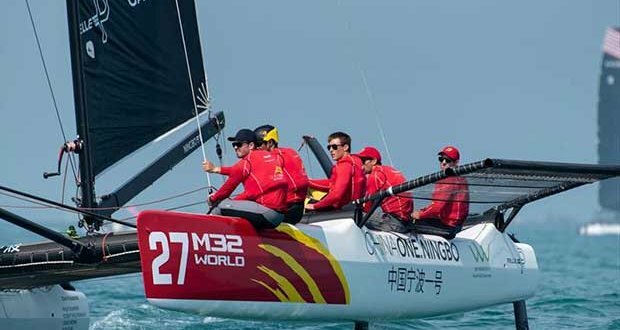 After a strong pre-worlds showing, Convergence continues an upward trend that has stunned onlookers this season, as the team looks to continue climbing the standings and pose a real threat to established favorites in the M32 class. Day Two begins at 1200 CDT, September 21st on the Chicago stadium race course.